I’ve been watching EURUSD closely (last post here). 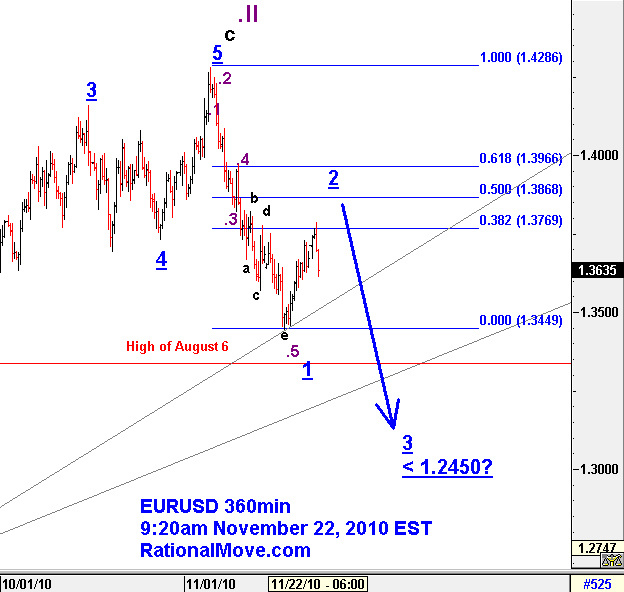 Now I think .5 is over with ending diagonal, and EURUSD is either in the middle of 2 or already finished it, too. 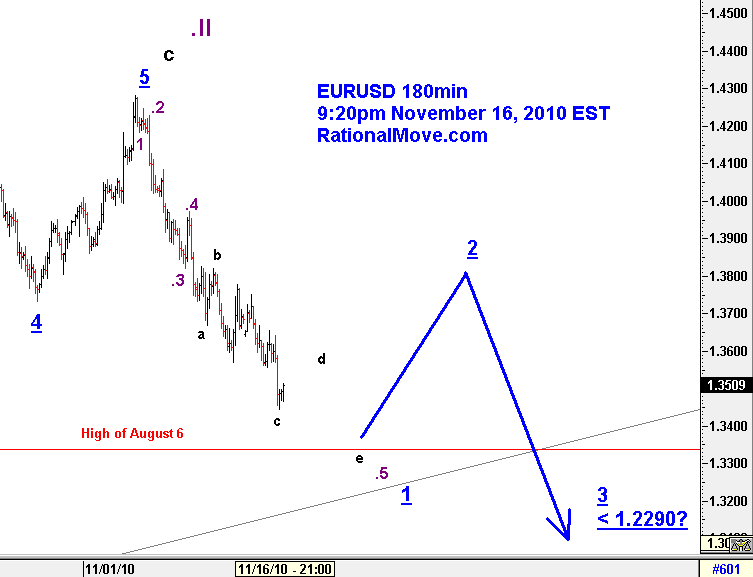 The sudden drop in this morning may be the beginning of powerful downtrend of 3, but I’m not sure unless EURUSD goes below 1.3449, or 2 draw a clear zigzag towards 1.3966 and start going down again. So, just to be prepared for the rapid development, I set a stop sell order at 1.3435 with stop loss 1.3790 for now. I will tweak this order as we see new developments. The drop of Euro against USD is not much of a news anymore. It may go further down towards the high of August 6 as in the chart below, but I wouldn’t jump in the short position from here as the wave may be forming a ending diagonal. I will think about it after I confirm 2. I took a loss on November 4 by being short of gold. Initial descent of the gold price was rapid, but the market soon reversed. Some people covered the short position early and made some profit. I held onto my principle and took loss. I lost money so I cannot call it a good trade, but the execution was not something I regret. Now the gold price went down suddenly again on November 12. 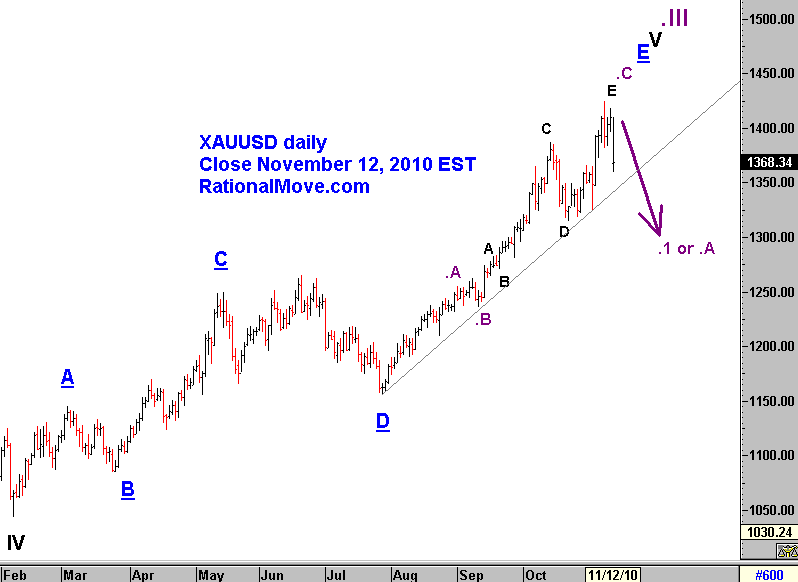 I will consider trying to be short of gold once more time if the next rebound will look like a corrective wave. 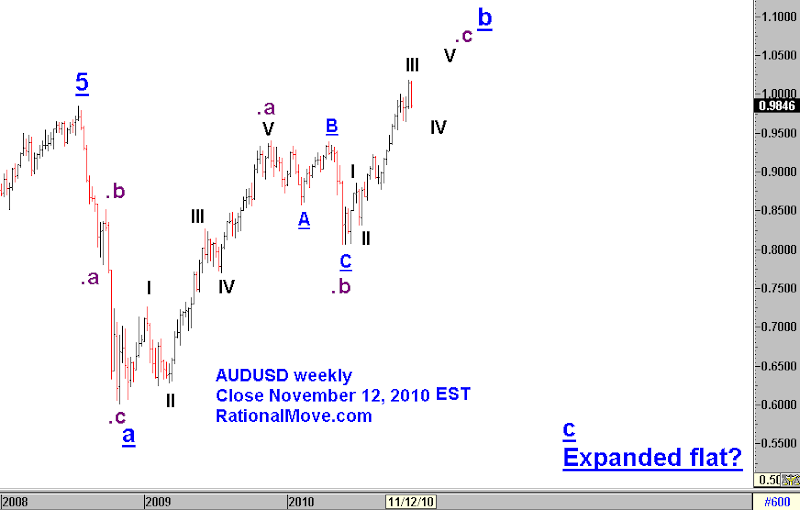 As everybody’s aware, AUDUSD overcame the high of the week of July 18, 2008 (shown with the label 5), and it even went beyond the parity. 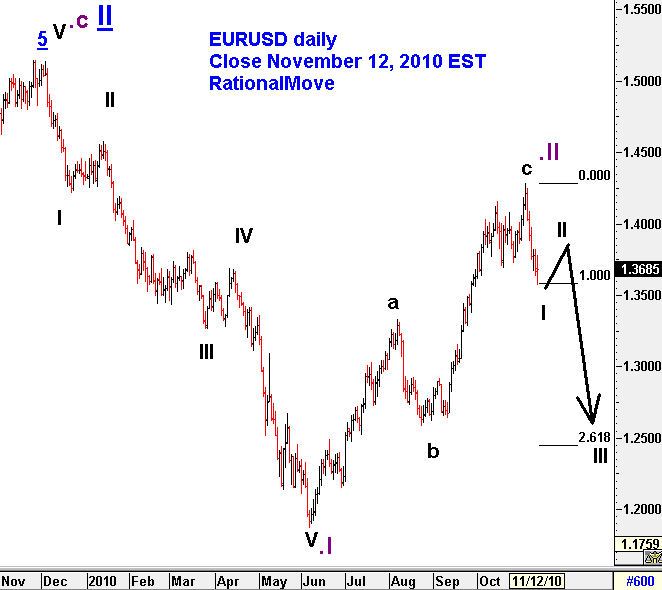 Once could count an impulse wave from the week of October 31, 2008. 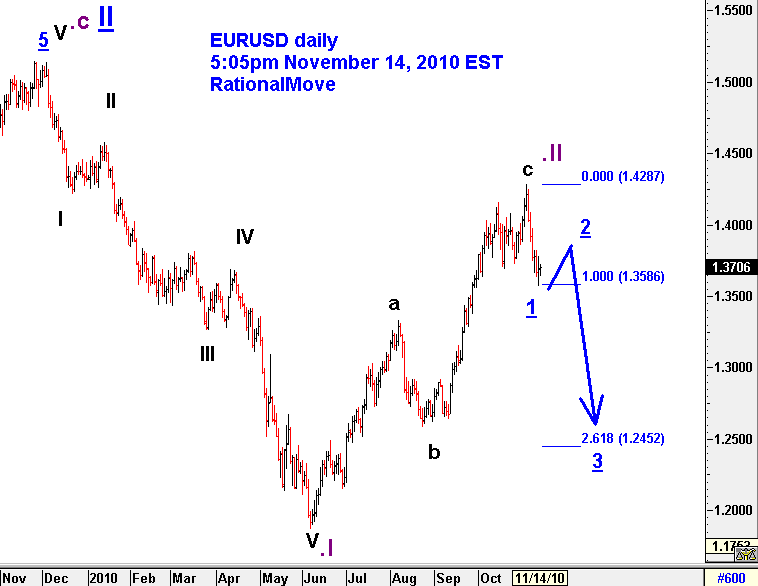 Or one can count the same period as b wave of a potential expanded flat wave as in the chart below. Either case, I would expect a substantial decline in Aussie against USD (and JPY) within a year or two. But I would wait patiently until I see a clear confirmation of the initiation of the decline. So, what is the immediate trading opportunity? I think it’s in being short of EURUSD. Last week’s big drop was just a beginning of USD’s striking EUR back. I wait for II 2 wave before crafting the details of the trade. Correction on 5pm November 14 : The first chart below, originally posted was mis-labeled. Please see the 2nd chart for the corrected version.